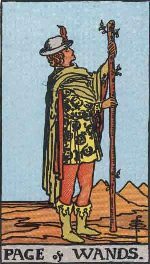 The Page of Wands card displays a strong and healthy young man standing alone in the wilderness of a barren land. He is wearing good clothes and holding a staff in his hand, which is a symbol of authority. He can use his staff to command others and also defend himself in the event of a challenge to his authority and determination to go ahead. The Page of Wands man is dauntless, confident, aggressive and a dominant personality. He welcomes challenges in his search for new horizons of knowledge and power. A unique characteristic of his personality is that he is essentially a lone campaigner—he shuns crowds. This allows him complete freedom to have his own way. Another reason may be that he does not like to be distracted by dissenting opinions.The message from the Page of Wands is that you can change your destiny by following your own conscience and charting your own path.